Home » Boat » Equipment » What Boat Tools for Circumnavigation? For Golden Glow I like to have the tools needed to maintain, break down, reassemble and fix every system on the boat. Okay, maybe I won’t be able to remove and replace a whole engine, but I’d get close. We carry a lot of weight in tools, in fact between the tools and the weight of our toys it is amazing that Golden Glow has any freeboard left at all. But each has it’s purpose and with the difficulty in finding consistent, quality workers, they are worth their weight in gold. If you are filling out your boat’s tool box, here are some Golden Glow thoughts on the subject. I have also included some pictures of some of the cool tools I find helpful on board. What boat systems do you want to maintain, repair or install yourself? 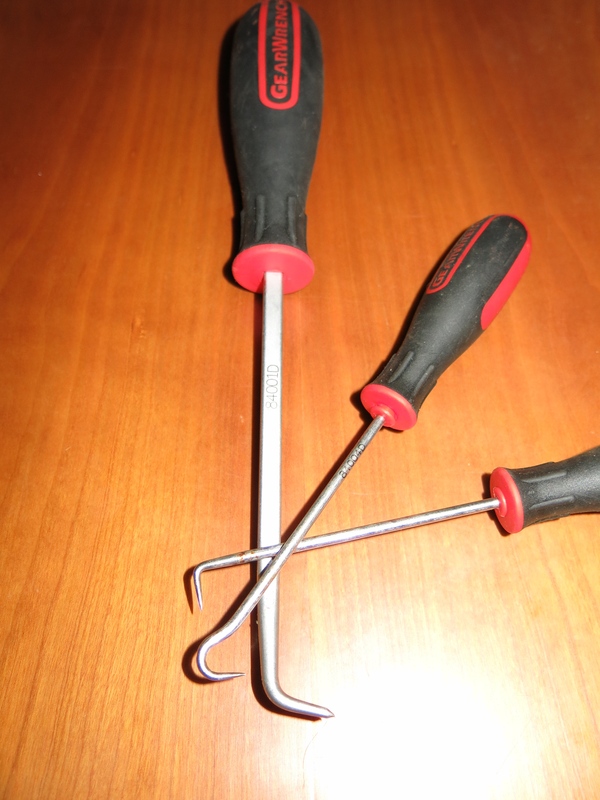 Cool Boat Tool – hooked awls / picks used for pulling hoses off barbed fittings and for lifting Racor filters and can be helpful with pulling impellers. 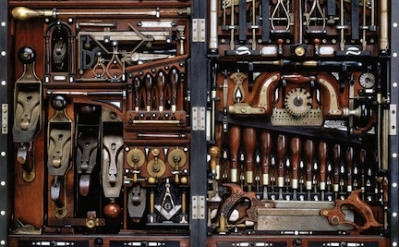 A critical step in determining the specifics of a tool-set is to review all the systems you have on board. The specifics of “must have” tools will reflect the systems you have on your boat. For example our in-mast electric furling cover requires a T50 torx to get proper access to grease the inner bearings. I think that is the only T50 torx on the whole boat. So that tool would not be needed on a sister ship without an electric in-mast furling. To determine the specifics for nut/bolt/screw type and sizes for each system you will need to review each of your systems. For now just a list of the systems is enough. Your list could include items like: engines, genset, outboard, watermaker, winches, shaft/prop assembly, rudder drive linkages, water pumps, bilge pumps, sump pumps, toilets, stoves, ovens, toys and the all important blender, etc. d) be able to install and remove the system. If you want you could mark each of the listed systems from #1. above with a letter a through d in #2. Be sure to check your spare parts list and determine that you either have the tools to make the repair, or expect you will have access to the tools and or expertise in the area that you sail. What tools are needed for your level of work on each system? Determine if you are competent to do what you have listed. If so, you can reasonably determine what tools are needed to do the type of work on each system. If you have not previously done the work on a specific system there are a couple ways to determine what tools you may need. a) get a copy of the service manual(s) for the system. These typically will be geared towards dealers of the product and may have many versions. Some are available online others are more difficult to obtain. Better manuals will have a list of tools needed. Be sure to check for mechanical and electrical versions of manuals. Check for service manuals, the operational manuals often do not have the detail to assess tools. b) hire a professional to come on-board and do a “training” hour with you. Be sure to ask what problems they see most often on each system, how to resolve them, what spare parts might be most likely needed, and of course what special tools are needed. Have them go though your tool kit if unsure. Definitely ask to look in their tool box and ask questions of any tool you don’t have. c) you can just start on a project while near a reasonable tool store and prepare to run out and get what you don’t have. Finally, take a safety inventory, some tools are unique to dealing with emergencies. For example during crossings I keep a couple of charged batteries and a portable grinder with a diamond saw blade installed for cutting stainless in case I have to cut any stainless cables / shrouds. We also have a bolt cutter as a worse case back-up. 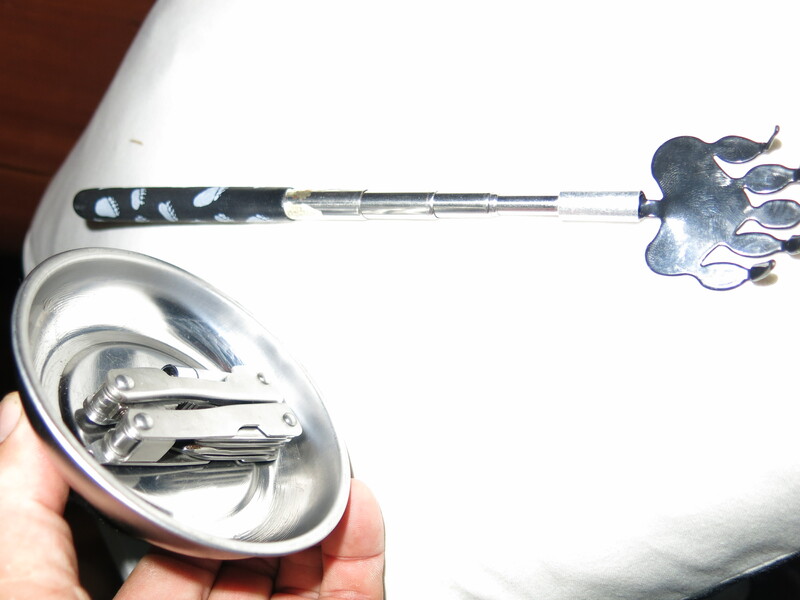 Grab bag tools and medical tools are both worth a review as well. When buying tools for the boat, I normally get professional grade, high impact, rust resistant with the longest warranties I can find (for life is good). This helps insure the tool will work when you need it. (Note on maintenance: tools need to be maintained. Keep them clean, oiled and organized for longer life). Cool Tool for holding items for soldering or gluing on a rocking boat. 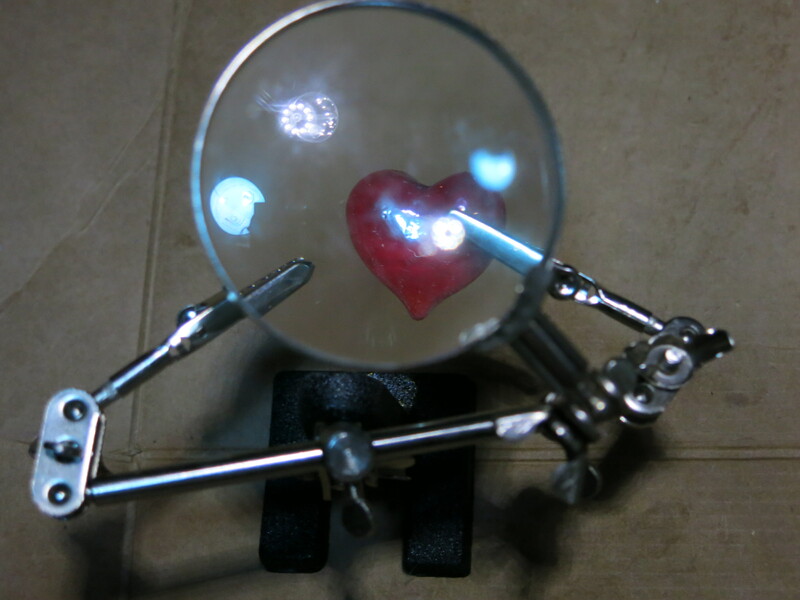 Also good for checking out Grinch hearts. Screw Drivers: medium and large handled screwdrivers with bits for slot (flat), phillips (cross), torx, allen (hex) and square (robertson). There are several variations for each screw head type and if your boat has particular head type, try to batch the bit type. Jewelers screw driver set with slot, cross and hex blades. Small Socket set with imperial and metric sizes and positive locking handle. The positive locking helps keep sockets from swimming when working over the water. Pliers to include: Electrician’s pliers, needle nose pliers and channel lock pliers. Optics: mirror or mirror on a stick, magnifying glass, head lamp. Pocket utility tool (Gerber, Leatherman) can be helpful as well. Smart volt/ohm meter with jumper wires. It is amazing how fast stuff gets loose when constantly underway. Having tools handy helps with taking care of loose stuff right when you first notice it. Sockets, ratchets and wrenches: both imperial and metric sizes to fit systems as outlined above. Include extenders, ratchet drive size adapters, bars, and universal joint adapters for 1/4” 3/8” and 1/2” drives. Deep well sockets that are professional grade strength are worth the extra cost. Wrenches should be both open and closed end. Quality universal joint adapters and flex drives can help with accessing hard to get nuts, bolts and screws helping to minimize the amount of dis-assembly needed to access that hard to get nut. These also help minimize the blood loss. Crescent wrenches (3 sizes to span maximum bolt size) check drive shafts for large nut sizes. 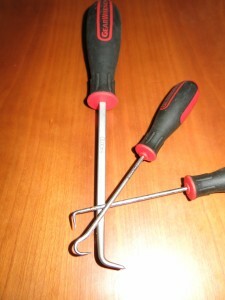 Vise Grips: large and medium regular with needle nose and clamp nose. Driver Set to take complete driver tip set for slot, cross, square, hex and torx heads. Flex shaft for attaching to electric drill good for reaching hard to get to locations. For Philips: a #1-#4 in long handle and #1 and #2 in short handle For slotted or flat 3/16″, 1/4″, 5/16″, 3/8″ long handle and short handle set. Pliers: heavy duty pliers (at least 2 sizes), channel locks (3 sizes), needle nose pliers (several types/sizes I carry 8). The telescopic back scratcher is very useful but the cool tool is the non-skid magnetic cup for holding screws and stuff on windy rocking decks. 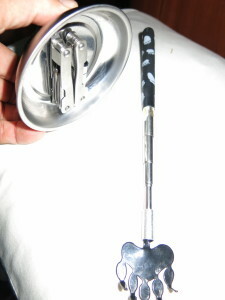 That is a utility tool held upside down in the cup: strong! No more screws gone swimming. Pump, gauges and valves for changing and testing freon for the fridge/freezer units. Consumables like sand paper, paints and sprayers, that make a difference, i.e.. I carry a paint can of the Volvo-green to spray any new part so the engine keeps looking like new. Construction Boat Tools:Portable tools are best if all use same battery and charging system. Higher voltage systems are normally more powerful. Drill and bit set to include metric and imperial drill sizes up to 2.5″ hole cutter. Grinder and disk set, include sanding disk and diamond cutting disk. Multi Tool and set of cutters and grinders. Saws: hack saw and blades, copping saw and blades, wood saw. Working block (wood) for drilling and cutting on and cutting pad (plastic) for smaller projects. Drop light and 120v extension cords. Supplies: electrical tapes, solders, fluxes, shrink tube, wires, connectors, fuses, tie wraps, mounts, liquid electrical tape, etc. Big Head Problems? This telescopic mirror “cool tool” is great for getting a view to where your head (and phone camera) just won’t fit. Like getting the serial number off equipment without having to remove it to see the back. Maintenance Boat Tools: I have small tool sets for frequent jobs like changing oil and fuel filters. Examples include: changing fluids/filters each of our 4 internal combustion engines: funnels, vacuum pump and hoses, pans, hooks, filter wrenches. Fiberglass maintenance: buffers, waxers, power washer, wet dry vac. Battery tools for specific gravity and a pump for filling water into wet cells. Paint and putty knives and buffers and all the cleaning tools. We also have a few fishing tackle boxes with specific pliers, knives and tools for maintaining reels and least I forget the blender: the tool of sundowner happiness… cool drinks do rule and every once in a while I hear the chant for Monkey Madness. We found a 12 volt blender on Amazon that was half the cost as the same blender in the chandleries on St Martin. 10 Comments on What Boat Tools for Circumnavigation? Hello Peter, thanks for the note. Yes, Antares is a great vessel, and getting better all the time. Nice thing about exchange rates is they change over time, and as more Antares are built you will have more countries to consider exchange rates with. Near the time we bought ours, another was being bought in Europe (Euro I believe). Best way to learn how to use your hands is to use your hands! I learned by holding flashlights and passing tools when a child, never too late to start and I am certain there is a mechanic somewhere right now that would LOVE to have better lighting and the right tool handed to her/him. Look forward to seeing you on the water!! Thanks for a great list. What about spares for each system? Hi Johnny, Yes, we carry many spares and the ideal list is unique to each boat, it’s systems, the type of sailing, the crew and the location that you are in, and of course the tools available to actually install the spare. As we are on a long term voyage I keep certain parts on the boat and others on land that I use to replenish the boat. I have started a post on this subject and will post sometime soon, until then I can say that manuals, mechanics, forums and past history / log books are good ways to determine what you need and one way to prioritize is based on safety factor if loss of system, failure rate, weight, cost, size, and availability in your cruising area. Ultimately, IMHO, a well maintained boat with fewer spares is far safer than an ill maintained boat, no matter the spares. Here is a link to a a blog post on the subject of spare parts: http://svgoldenglow.com/2016/06/sailing-cruising-spare-parts-list.html. I also carry a full tap and die set along with deep well sockets. Many times when I have asked someone for help, I have the tools they need which saves me time and money from them having to go to their truck or come back another day. I also agree on the statement of ask to see the tools the tradesmen have as that’s how I continue to add to my supply. I may not be able to fix it, but I don’t have to wait for a tool to get it fixed! Great list. Hey Bob, great suggestions, I like the comment of saving trips for the tradesmen. I have pondered getting a tap and die set, and have been slow to pull the trigger: is there a “most used” range of thread type, diameter and standard you have found use for? I will add that to the list as an option. Will add the “deep well” to the list too, we carry those on Golden Glow and have been thinking of getting rid of the standard set, as I have yet to find a place the longer length of the socket is an access issue. Though expect I will as soon as I get rid of them. may the breeze always be in ur back. Hello Peter, I’m glad we can offer some help. So far we have done many, many upgrades and super attentive maintenance, but Golden Glow has had only two problems: one was a worn out part on our watermaker, that we replaced. The other a short in our main furling electric engine, that was caused from wear inside the mast against a cable. That was easily fixed once I found it. Both very minor issues, so all in all we have (knock on wood) not had any serious repairs. Having said that I spend a lot of time on preventative maintenance, so the work is definitely there, just proactive. Thanks for the comment. Best breezes to you too and best of luck in your catamaran shopping. Check out Antares (LiveAntares.com), we love our 44i and could find no better fit for our couple’s world adventure.